Come experience Rancho Cacachilas for a day visit or a multi-day tour package, depending on your flavor of adventure. You’ll get the chance to immerse yourself in beauty and nature, as well as to learn about the daily operations of our conservation-focused working ranches. We focus on small groups and personal service. Your guide will go the extra mile to ensure that your day is filled with adventure and insights in the wonders of our Baja California Sur mountain eco-system. All day tour options include lunch, beverages and shuttle to/from the Rancho Cacachilas Mountain & Bike Hub in El Sargento to the Rancho Cacachilas ranch complex in the mountains. Looking for trail system information - explore our Mountain Biking, Hiking and RunningTrails here. Enjoy guided access to our well-groomed private trails in the Sierra Cacachilas mountains. Connect deeply with nature, learn local history and gain insight to some of the working ranch activities that take place every day. Each hike is supported by a pack mule who is the porter for your cold drinks and snacks, too! Enjoy a Hiking Day Tour for $75 USD per person. It’s no secret that we love our mules… and this day tours gives you the chance to experience that love, too. We’ll roam private trails on our trusty 4-legged companions, stopping to enjoy the sights as we go, as well as a trailside lunch. Enjoy a Mule Riding Day Tour for $75 USD per person. Experience our world-class trail system in the Sierra Cacachilas mountains with guided day trips available seven days a week. Experience our secret Sierra singletrack trails during your ranch stay and then unwind with great food and craft beer after your ride back at our Rancho Cacachilas Mountain & Bike Hub in El Sargento. Shuttles provided from the Hub to the ranch trail system. Need to rent a bike? We have mountain bike rentals available separately. Coming Soon- Unguided day trip access to our Rancho Cacachilas biking and hiking trail system is available on the weekends. Contact us to learn more and reserve your trip! Visit the ranch for the day and experience a true culinary treat! From handmade cheeses, our organic gardens, and the honey our local honeybees produce to freshly caught red snapper and oysters from sustainable ocean farms; you’ll see how your food is made and prepared, and then (the best part) you’ll get to enjoy it in an abundant Farm-to-Table meal with friends. Enjoy a Culinary Ranch Experience for $85 USD per person. One day isn’t enough to experience all that Rancho Cacachilas has to offer! These multi-day tours combine your favorite adventures with culinary delights, natural history and the soothing relaxation of off-the-grid, nature retreats. Enjoy guided access to over 60 km of Mountain Biking, Hiking and RunningTrails. Multi-day tours include lodging, all meals, and activities. Ride through a network of prime singletrack developed to IMBA standards. You will feel immersed in the beauty of the rugged Baja California Sur mountains, exploring their endless cacti diversity with every twist and turn. Enjoy great food, cultural exposure and superb views of the mountains overlooking the shimmering Sea of Cortez. Your authentic Baja California Sur working ranch adventure getaway offers hiking, mule riding, mining ruins exploration, cheese and wine tasting, and Farm-to-Table meals. You’ll be amazed at the abundant organic produce we grow here in the rugged Baja mountains next to the Sea of Cortez. 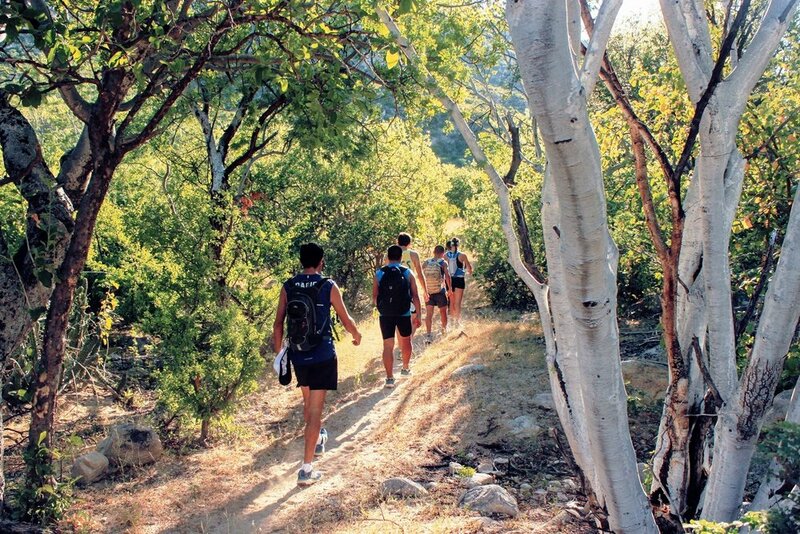 Explore the alluring dryland forest of the Sierra Cacachilas on an outstanding network of hiking trails that overlooks the azure Sea of Cortez. You’ll love the total immersion into nature and being off the grid with only solar powered energy and no wifi waves of distraction. Dark nights, amazing stars, natural history, pictographs, 100 year old Cardon cactus forests and culinary delights await you.